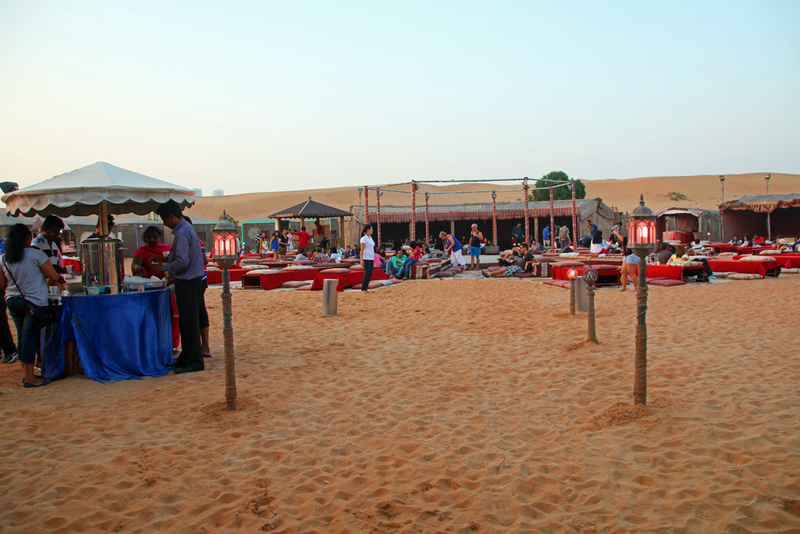 Imagine you are in the desert and watch how the sand dunes around you change their colour while the sun sets. You have dinner with Bedouins, you sip fresh mint tea and listen to the Bedouins playing their instruments while million stars above you illuminate the sky. This is the dream of many people and it was a dream of mine for many years. 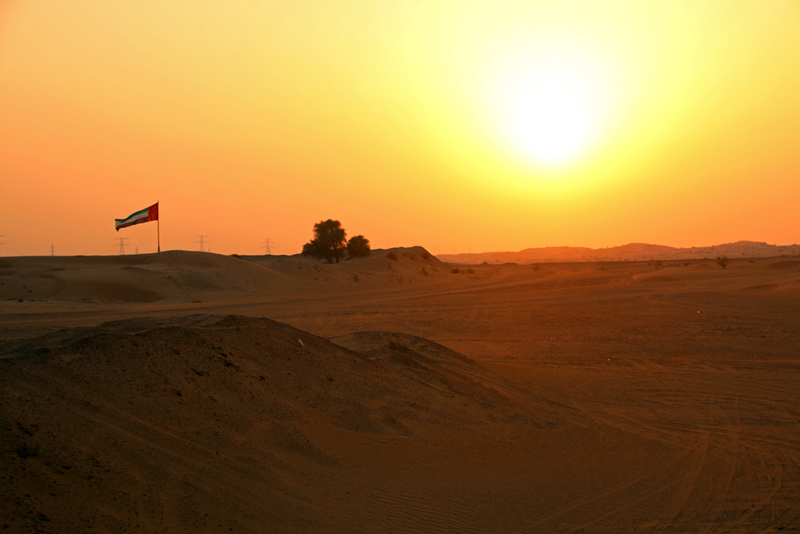 That is the reason why I booked a desert safari in Sharjah during my fourth stay in Dubai in October 2014.It was late afternoon but it was still hot when the driver picked me up at my hotel in Dubai. 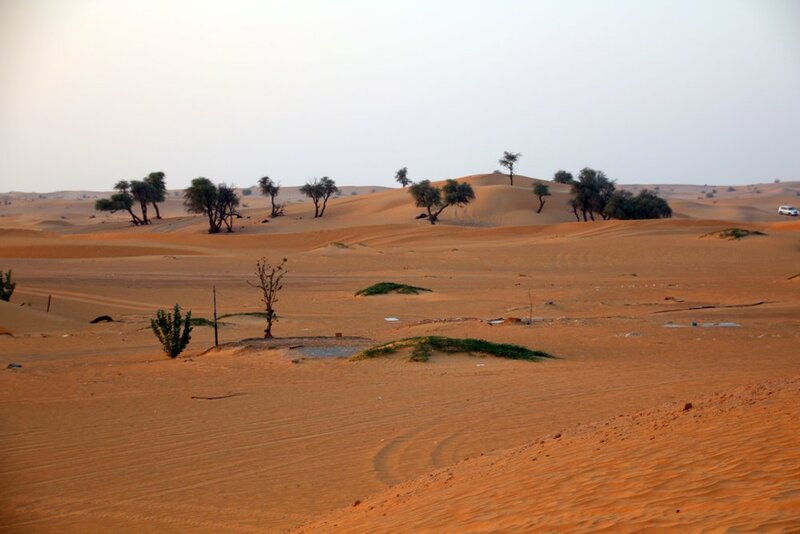 I had decided to take the desert safari in Sharjah, the neighbouring emirate of Dubai, because I hadn’t been there before and I had heard that it is a great place for a desert safari. Sharjah is the third largest of the United Arab Emirates and the only one which shares borders with all of the other six emirates. It is also the only one which touches both, the Persian Gulf and the Gulf of Oman. Sharjah is the most conservative of all seven emirates. Alcohol is strictly prohibited for both, locals and foreigners. Two Australian couples who I had met at my hotel the day before were on the same tour like me so that we were six people in the car altogether with our driver. We were picked up with an enclosed jeep. I was really lucky to get the front passenger seat next to the driver so that I could take photos during the desert safari. The drive to Sharjah was shorter than I thought. 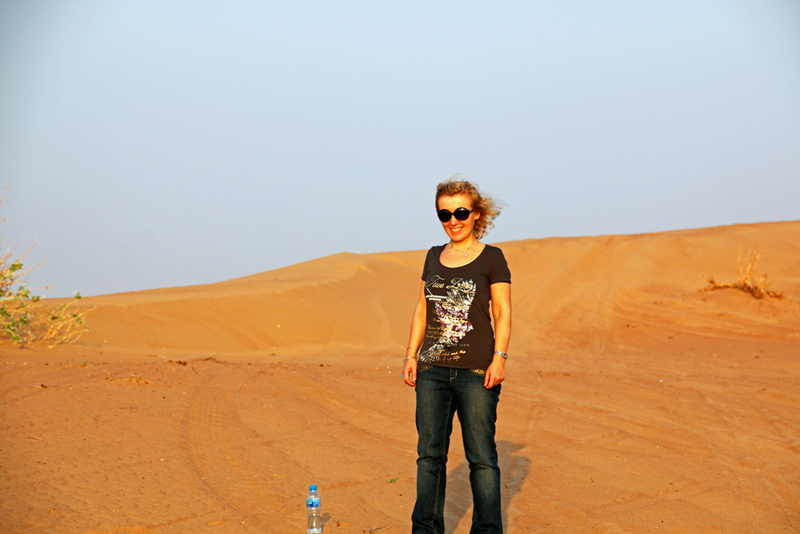 After about one or one and a half hours we reached the edge of the desert of Sharjah. 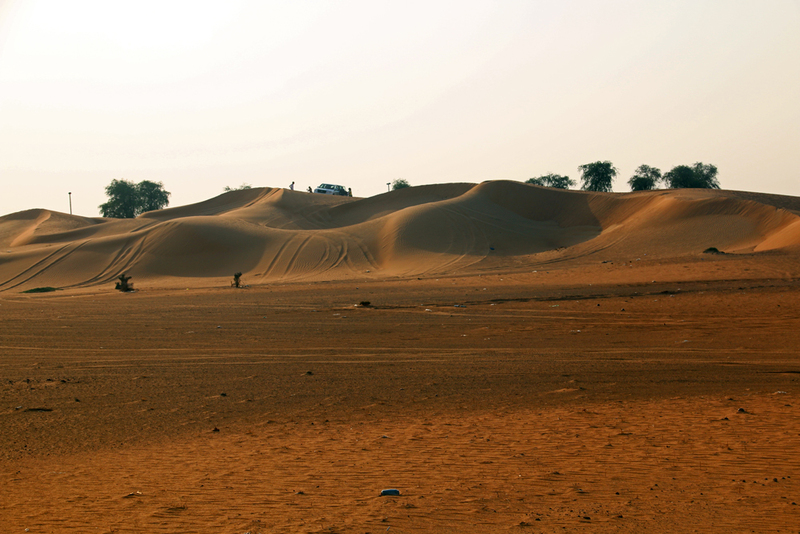 Our driver left the paved road, drove into the desert and stopped. He deflated the tyres and continued the drive through the desert. 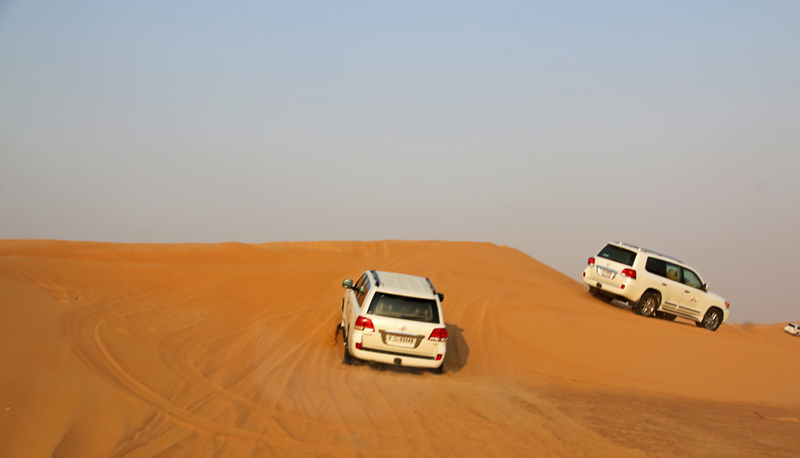 Smaller sand dunes appeared to the left and right of our car. The sand dunes got higher and we started something which is called „Dune Bashing“. The sand dunes were right in front of us. Our driver accelerated the car. 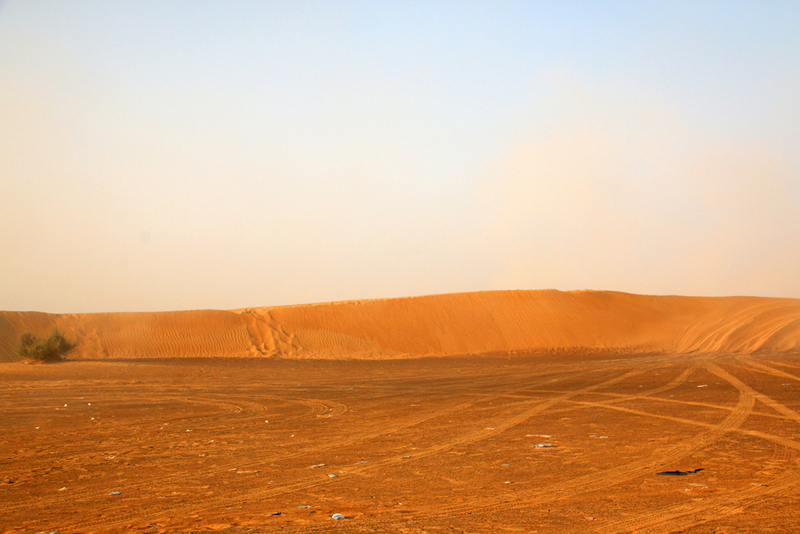 He drove up the first sand dune and let the jeep jump down. Then up the next sand dune and down again. Further dunes followed, we drove up and jumped down again. Behind and in front of us were other jeeps. We continued the Dune Bashing for about half an hour and were thoroughly shaken. Fortunately I had taken motion sickness tablets before the drive into the desert so I didn’t feel unwell but other people in the car got really sick. We stopped probably because of them and had some time to walk around in the desert. Afterwards we bashed more sanddunes before heading to a desert camp. In front of it several other jeeps were parked. Two camels were leashed next to the entrance of the camp. Inside a stage was built up in its centre with several deep tables and seat cushions surrounding it. A selection of drinks was included in the tour price, further drinks, shishas and souvenirs could be bought at several stalls which were also built up in the camp. Loud music blared from the loudspeakers. We also had the opportunity to ride on one of the camels but I refused. Visitors sat on the backs of the camels and these poor animals walked a few times around in a circuit and that was it. Since the dinner wasn’t ready yet a few people and I left the camp again. We walked up a low sanddune and watched the sunset from there. There were for sure better places to watch a sunset in the desert but up there we had a better view and it was more quiet than in the camp. When we returned, dinner was ready and the other people had formed a long queue in front of the buffet table. The food was ok but it was nothing special. I sat together with the two Australian couples of my hotel. We enjoyed our dinner and tried to talk to each other but it was almost impossible because the music was so loud that we literally had to scream at each other. It felt like being in a disco. 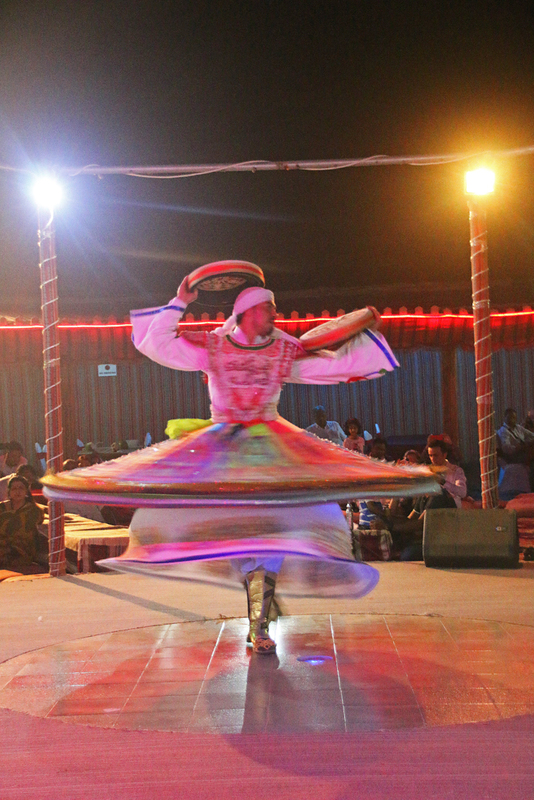 After dinner some sort of show started with a whirling dervish. Originally dervishs are members of a Muslim ascetic-religious community which are especially known for their modesty. 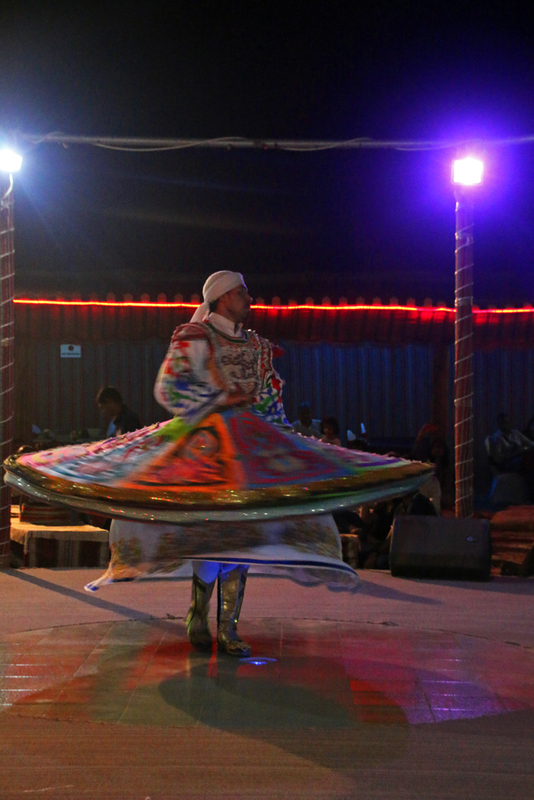 The „Sema“, their trance dance, consists of circular movements which is a form of approach to Allah. It stems from the Mevlevi order in Konya in Turkey. 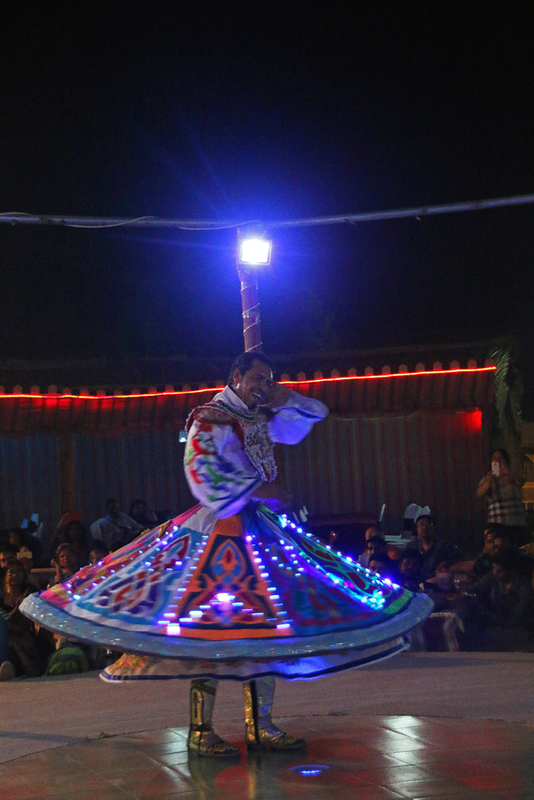 Different than the original dancers our dervish didn’t wear a black cape over a white robe – clothing which symbolizes death and life – but a costume which was spiked with several colourful lights which lit up while he was whirling. The background music wasn’t played with instruments but still came from the loudspeakers. 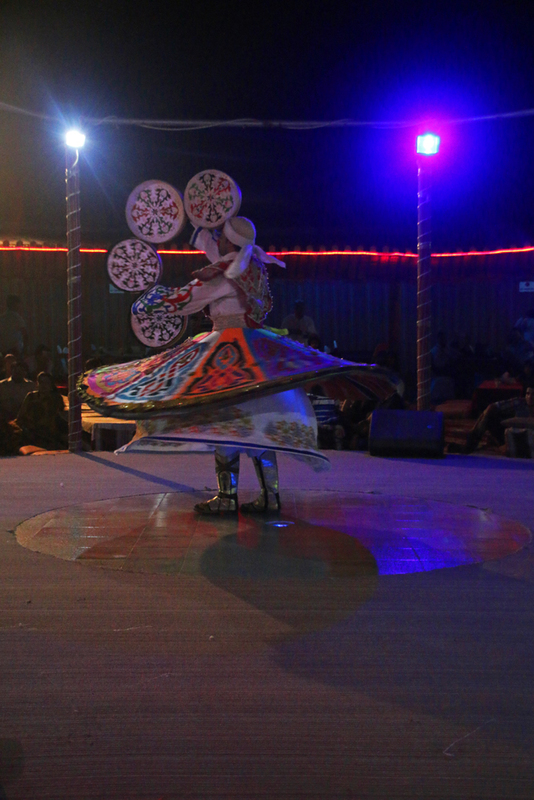 When the dervish had finished, a belly dancer went on the stage. She was a pretty lady with a nice costume and her performance was good. But after about two dances she started to encourage the visitors to join her and try to do the belly dance themselves. Several people followed her invitation and started to shake their bodies and made some dance moves which apparently ought to be some kind of belly dance. A further 10 to 15 minutes later the show was over and the organisers pushed for a swift departure. Outside of the camp we met our driver again. After about one or one and a half hours later we were back in Dubai where the driver dropped us off at our hotel. 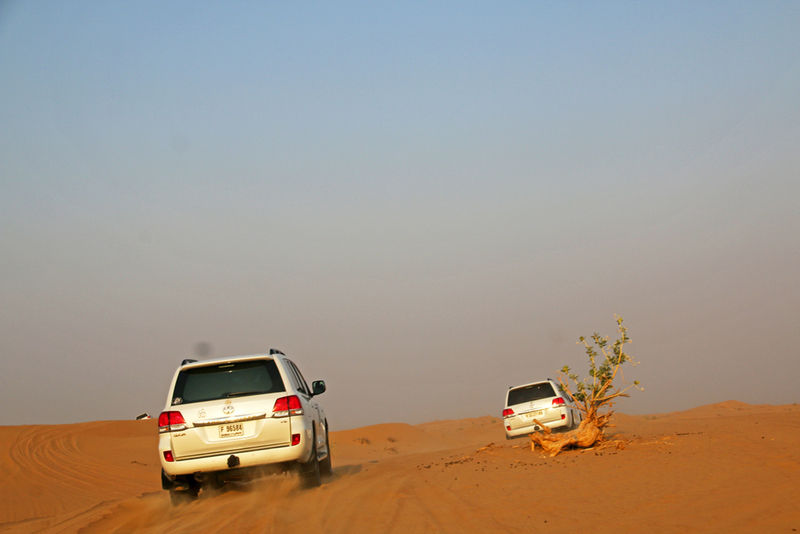 Was the desert safari in Sharjah really worth the money and worth going? I would say it depends on you. If you don’t mind touristy activities it’s maybe ok for you. But if you prefer a real, a pure and an authentic experience like me I wouldn’t recommend it. It was a very touristy tour not an authentic experience. That is why it wasn’t really my thing. I did the desert safari during a two day-stopover in Dubai on my way to Beijing where I started my journey along the Silk Road of China from Beijing to Kashgar. Only 15 days after the desert safari in Sharjah I rode on a camel up the Mingsha Sand dunes in Dunhuang in Gansu province where I experienced the sunrise. In November 2015 I explored Wadi Rum in Jordan. We also did a jeep safari in Wadi Rum but we did it in open and not in enclosed jeeps and watched the sunset from some high rocks. We did a nightwalk and prepared marshmallows and hot tea over a campfire. We slept in tents and rode on camels into the Wadi where we watched the sunrise. 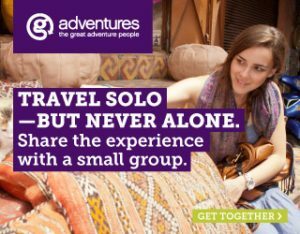 In July 2016 I stayed overnight in the desert close to Aydar Kŭl lake in Uzbekistan, slept in a yurt and listened to locals who played on their instruments while sitting around a campfire at night. All these experiences felt real, pure and authentic and were definitely worth every penny I paid. 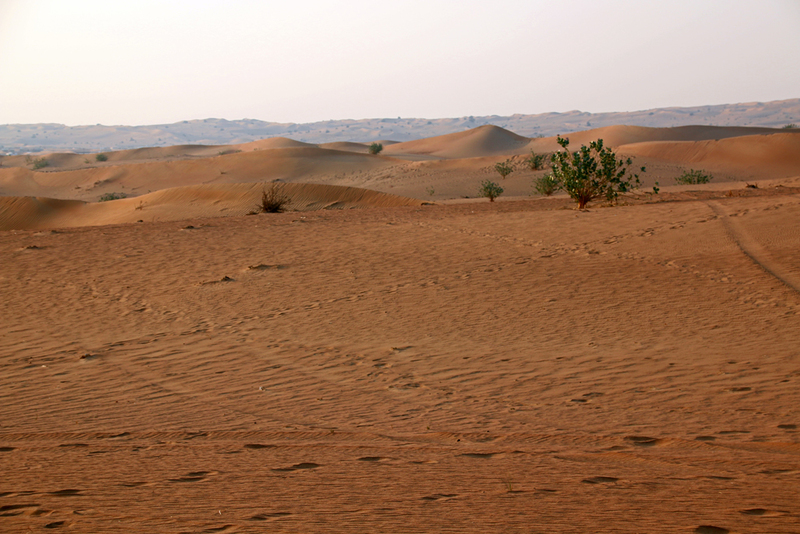 I had booked the desert safari through my hotel in Dubai. Usually I would have had to pay 280 AED (about 71 Euros) but I got a discount and only paid 250 AED (about 64 Euros). I don’t know why I got a discount, I didn’t ask for it and didn’t mention that I was a travel blogger. I guess the hotel and the tour operator just wanted the tour to be fully booked. Considering how many jeeps there were in the desert and how many people were in the desert camp I think that is quite expensive. Imagine how much you could do with that money even in an expensive destination like Dubai. 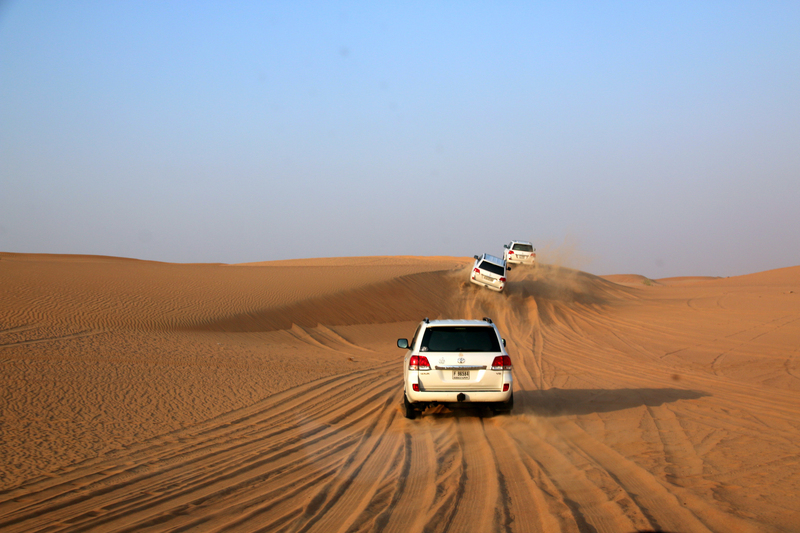 If you would really like to take a desert safari in either Sharjah or Dubai: an executive of Dubai Tourism told me that Platinum Heritage offers tailor-made tours. They are probably more expensive but he said they are more customized. 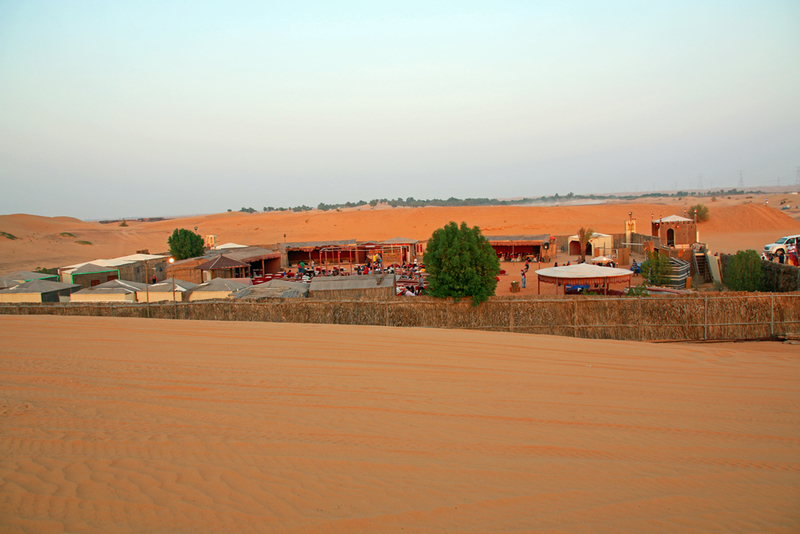 A former classmate of mine, who is often in Dubai, just recommended me the desert resort Bab Al Shams. 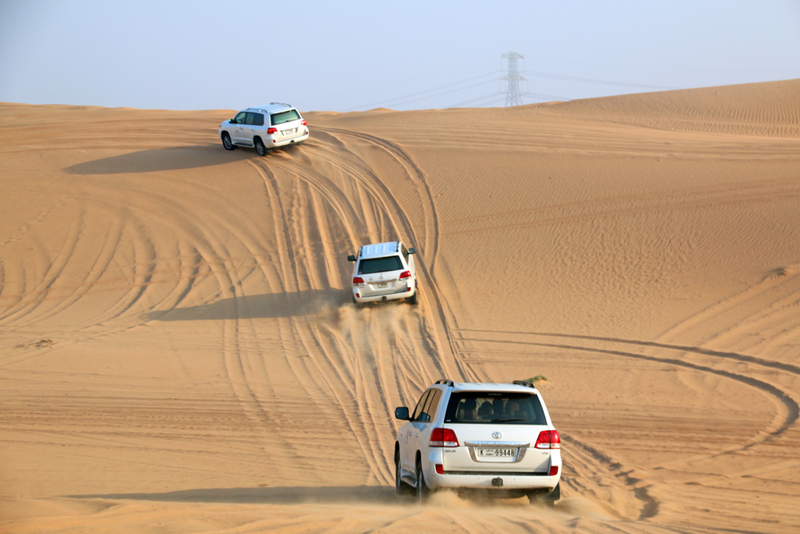 From Dubai you can get there by taxi, rental car or organized drive. This resort also organizes desert safaris, which are said to be more authentic but Bab Al Shams is a resort of the upper price range. However, if you decide to do a desert safari with Dune Bashing like me, make sure to take a motion sickness pill before leaving your hotel. I took a pill short before we left the paved road and drove into the desert and I didn’t get sick. But I think, I would have felt more comfortable if I took it a little earlier. Generally I love your comments. However, I just deactivated the comment function because I am working on a redesign of my blog on a subdomain which will appear on this website in a while. During that time your comments on this blog would get lost. But I would be happy if you’d leave me a comment on my Facebook page, if you would like that page and follow me on Twitter, Instagram, Google+ or Bloglovin.